It's likely that I have a Y Chromosome as it's been working for me so far. 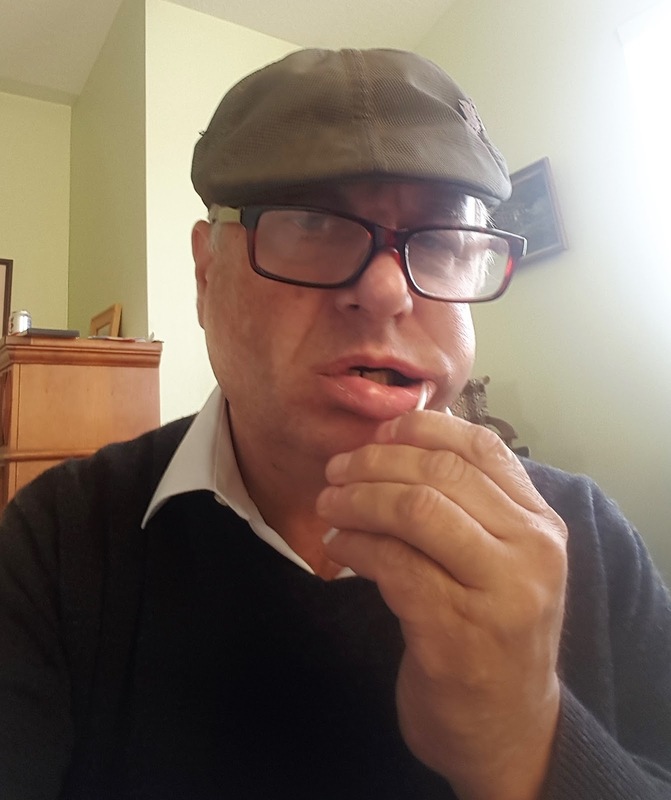 Frustrated by the imprecision of the Ancestry.com test, as good as it is. And with more people taking it the better it gets. I still need some info on my direct paternal line. That's what I've been researching and we have that one illegitimate birth. We have circumstantial evidence for the father, but it would be nice to pin it down. There's also the question as to whether we can pin down the medieval Vaughans who were sufficiently wealthy and of the gentry with even a few knighted to sire significant offspring legitimate, illegitimate, and otherwise. I mean, everybody in the Glasbury/Talgarth area of Breconshire are probably related anyway. The most likely multiple-great-grandsires are those who had the monetary means and power to get away with it. And then there's the tantalizing mystery of ancient origins. My son's test from 23-and-Me said his Y Chromosome "looked like" it came from Irish strongmen, one of whom we know established the Kingdom of Breichniog that become Brecknock then Breconshire. 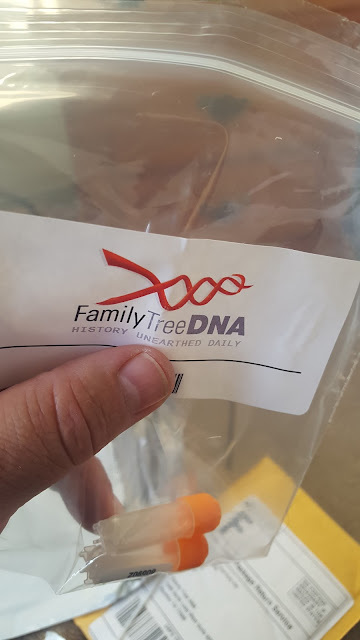 So, I ordered a detailed Y-Chromosome test from Family Tree DNA. It's the mid-range test as the top-of-the-line seems to be for establishing a common father with a male sibling, My brother and I already accept what our parents told us. The kit comes in a smaller package than the Ancestry.com test. Seems easy enough. All the equipment checks out. And I've seen a few police dramas with DNA samples taken. 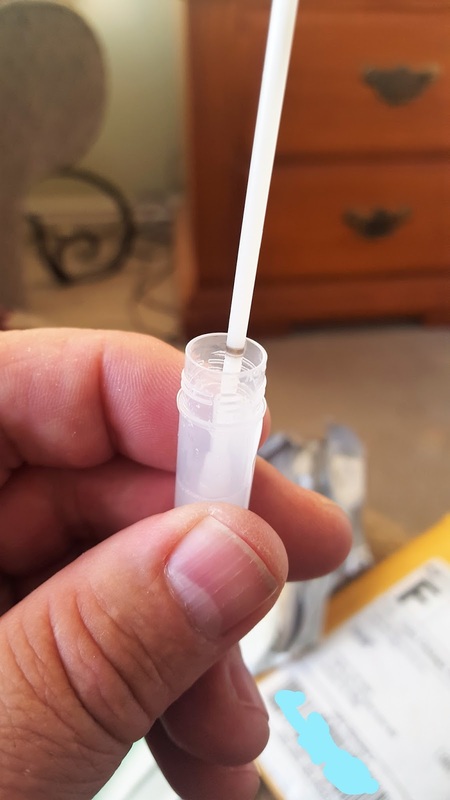 Then you stick the swab end in and break it off at the line. 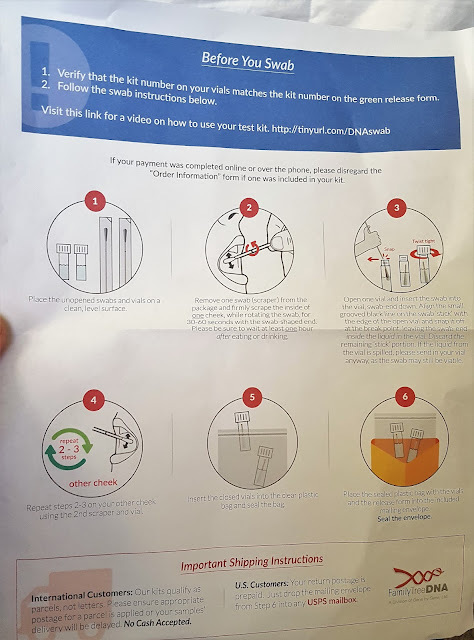 It says "no worries" if you spill some of the fluid because your swab may still be viable. 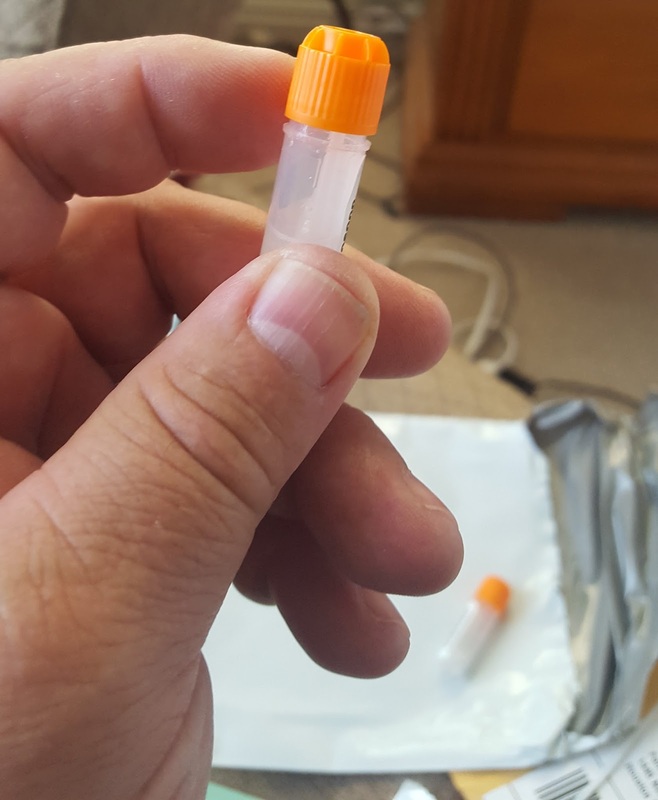 And I didn't spill one drop! No runs, no drips, no spills! I did both cheeks and screwed down the lids on my swabs. Then they went into the plastic bag. 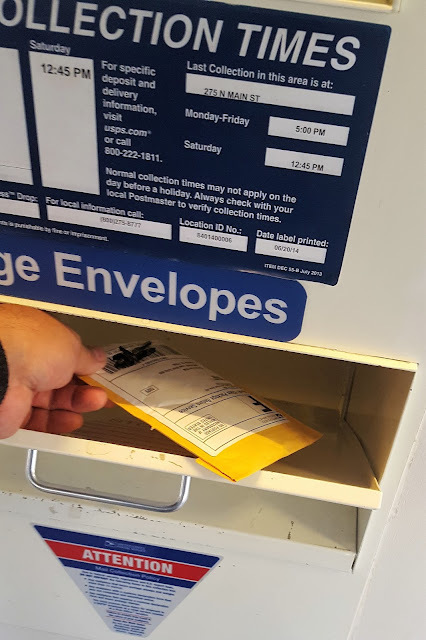 And off to the post office to drop it in the inside depository so nobody can steal my DNA out of my mailbox. Now we wait to see how much of an Irish Pirate I am. 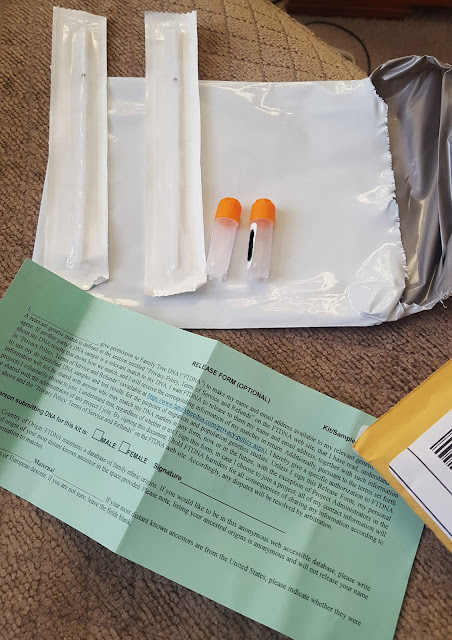 My only worry is that my cousin who is a Scientist of Phlebotomy recently switched jobs to work for Ancestry.com. 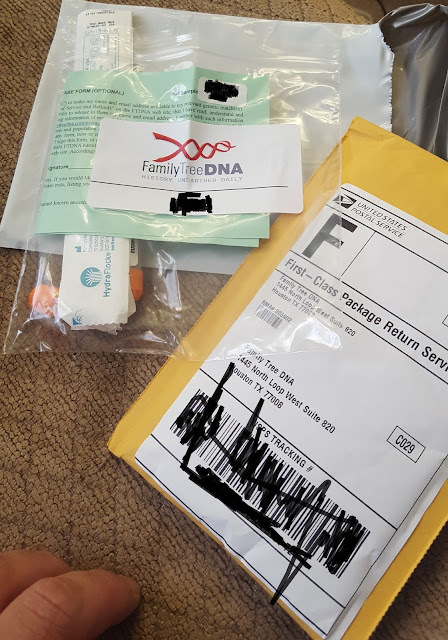 She said that the photos of my spitting into the tube that I posted on my earlier DNA test had made it into their informational pics. I should be getting royalties or residuals or something.